What is the best solar controller for your installation? Your Position: > Knowledge >> solar controller >>> What is the best solar controller for your installation? The visible spectrum from red to blue light is where the panel gets it energy. The higher frequency cooler blue light contains more energy than the warmer red light. This graph shows several of the electrical characteristics of a nominal 12 volt solar panel. The three static solar irradiation levels clearly affect the current / power available from the panel. Notice how the panel supplies a relatively constant current from a very low voltage all the way to about 12 volts. The panel can be considered a constant current source. Additionally notice the maximum power output of the panel is at a voltage point past where the current remains almost constant. No temperature related changes can be seen from this graph. In the image below, we can easily see the negative effects of a higher temperature on the panels output. The higher the temperature the lower power output of the panel. This graph again shows the effects of reduced solar irradiance on the panel’s surface. Notice how the power output not only reduces with less light but also flattens out as it decreases. This flattening of the power curve severely challenges the MPPT controller tracking algorithm’s ability to gain maximum power from the panel. We now have a basic understanding of a few adverse environmental effects on the panel’s ability to harvest electrical energy from the sun. This helps us better understand how the two basic types of solar charge controllers actually harvest the energy from the panel. Let’s remember the panel can be considered a constant current source and the battery is considered a constant voltage source. Now let’s take a look at the fundamental operation of a PWM controller. These controllers use a Pulse Width Modulation scheme, aka Duty Cycle Change, to directly connect and disconnect the panel to the battery. When “on” the panel and battery are directly connected together. The repetition or operating frequency is fixed by the green hash marks, while the on versus off duration, aka duty cycle, varies depending on how much charge the battery requires. Note when the waveform is high the panel and battery are directly connected. The panel’s voltage drops to the match the batteries voltage when connected together. Assume a single 12 Volt nominal panel that supplies a bit over 20 Voc (Voltage Open Circuit). The PWM controller connects the panel to the battery (a constant voltage source) which is sitting at about 12 volts. The panel voltage has to drop to match the battery voltage. This action results in the panel no longer supplying its maximum power which is at Vmp (Voltage Maximum Power). “Ohms Law” states (P=IE) Power = Current multiplied by Voltage. 12Vdc * 3.2amps = 38.4 watts harvested from the panel. The panel is rated at Vmp * Imp (Current Maximum Power) = 53.375 watts. What happened to the other almost 15 watts available from the panel? Where did the extra wattage go? It was simply not harvested using a simple PWM controller. 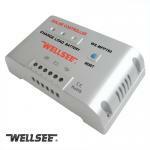 There are several additional variables including the battery SOC (State of Charge) and temperature. The above is a static example to help get a point across. PWM controllers do a good job at harvesting the electrical energy under a variety of circumstances and have several advantages over the more complex and expensive MPPT controllers. It’s a requirement that the panel / array nominal voltage closely matches the battery voltage. As seen above the larger the difference between Vmp and battery voltage the less efficient the PWM controller becomes. All PWM controllers have a rated maximum input voltage. Exceed this voltage and the controller will be rendered useless. 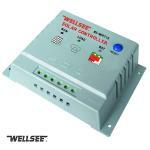 All controllers (PWM and MPPT) are rated with a maximum output current. Higher quality controllers will throttle back when the max current is achieved, however some will self destruct. Make sure the controller is rated higher than the maximum current available from the panel / array. Choose a controller with a large enough current rating to allow for future expansion. There are some advantages of a MPPT controller, typically a higher operating frequency is used in the MPPT controller’s PWM charging function which results in a reduced RFI / EMI condition. The result less interference with Radios and TV’s. It is true you typically get what you pay for. The more expensive controllers offer a more advanced feature set. Features and functionality vary greatly from vendor to vendor. You need to do your homework. Understand what it is you desire then make your own choice as to which best meets your particular system requirements.